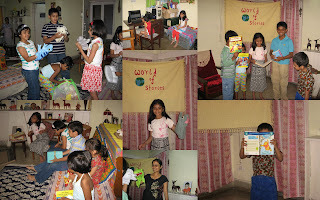 SOULspace: WSD-20th march:A day for stories..isnt every day one?!! WSD-20th march:A day for stories..isnt every day one?!! So did you tell a story? World Story telling Day is celebrated on March 20th to coincide with the summer/spring equinox in the Northern Hemisphere. Reading a Katha or sharing a story from the Ramayan/ Bagavatham is part of our Indian Culture. This was usually done in the temples to the accompaniment of some music. Even without the music the teller's voice was of the most sonorous and lilting quality, and one could sit mesmerised for hours listening to stories that he would intersperse with jokes and local flavour. My memories of attending such events go back to my childhood in Chennai. During the summer holidays we would be packed of from our urban Adyar home to my grandmother's house in old Mylapore near the Kapaleeswarer temple. Evenings were magical as we scampered behind her almost every day to the temple, and invariably in the evening some Katha-kalakshebam would be there to entertain us. (jasmine flowers), on one side and men in pristine white dhotis on another, the fragrance of agarbathies (incense) and the magic of a story! Even till date, these places retain their age old charm. The temples are the same, maybe with some additional colour, the agraharam and the gurukkal( the learned pundits) are the same, though they may own a cell phone and a car too! Yet what has changed is the anticipation and enthusiasm for oral story telling. No longer are these venues sought out for stories, mythology and culture. We have been brain damaged by multi media. I am not against technology, not at all. But it isolates us from humanity, where as Oral tradition, brings the community together. Just try it...call a group of friends or family and share stories....see how magical the evening becomes. Savour it! The day started with my kids listening to Esio Trot and Fantastic Mr.Fox on Audio, downloaded from the net. For those who are not Roald Dahl fans, I must tell you, you are missing something!! My daughter absolutely adores him. What we love about him is his sense of humour and the way he makes up the most atrocious things. In spite of the accent I must say the twosome, couldnt get themselves away from the room, even to brush their teeth...! That was in the morning, later in the evening I had invited a group of my children's friends. Asked them to come over and tell some stories. I started the evening by telling one of our favourites, again by Roald Dahl: Enormous Crocodile. The reason I choose this story was for its dramatic content, and its familiarity with kids. For these children this was the first time they had come to a story telling event. There were 12 children and after I finished my story, I asked them to share theirs. Children truly enjoy this medium. I had restless group that day, I would only say it was because they had to sit and hear other children. I was happy to hear Panchantantra stories, not surprising as Indian children are raised on a healthy dose of them. My daughter spoke about her favourite book The Twits ( yes Dahl again!! ), and my son insisted on reading out a Pooh book. There was Androcles and the Lion, by one child, and what I loved was that he did not use the names, Androcles, the King etc, he called him the dirty man (slave)!! Obviously this was his own interpretation of the story. Another child told the story of "Strength in Unity", and even had a story within a story, where the pigeon king teaches his flock about Unity by telling them about the 2 headed snake that ate poison to spite the other head, and as a result killed itself. There were two more Panchatantra stories, of a Widows folly and an uncommon story I had not heard before. What a great day. I enjoyed myself, and hope to make this an annual feature in my home! Stories are good as long as they are not taken as facts. Same pinch, My grand parent's place is also mylapore(kutcheri road). Oh those sepia toned times. It keeps surfing up for me too. Even now, i love to listen to harikatha's of Vishaka hari(u can find her in you tube) and another lady called manimegalai. Their sessions simply mesmerise you. very thoughtfully engaged your neighbourhood children. Now it is our turn. when is ssstory teller comin to our neighborhood? I did not know about WSD :( How sad for me :( But thanks for putting up the post, I will read it at leisure. I put up a blog subscription at Naradtales. Is this what you were asking for? Do check and let me know.